Re: Buying a used s1000r - what to look for? dangers? Thanks mate! I won't go through the hassle of importing. German bureaucracy is a nightmare and I don't want to wait much longer. Do you by any chance know if there's any difference between the 2018 and 2019 production year? Even minor ones? Paint color. they removed the Catalona grey and added Black metallic instead. I like the new Black metallic a lot but I'll go with the white one. Got an offer today, 15600€ brand new + HP levers. It's from 2018. Any concerns when it has been at the dealership for a few months and just stand there? The cheapest offer I got was 15390€ but 1-2 weeks shipping time directly from the BMW factory. Which one would you guys take? Are the HP levers worth it? My 2 cents. Its a lot of motorcycle for a first bike. Your focus should be developing solid skills and practice, practice, practice. Invest in good quality riding gear, which itself costs a bundle. you'll see soon enough there are no shortage of ways to spend on mods! Hooligan makes a good point - it is a lot of bike for a first bike. That said, the bike does everything so well you will be having fun. I appreciate your input guys! I'm still a bit intimidated by the S1000R to be honest. But it's a like with your first girlfriend. You're not aiming for an ugly skunk just because you're no good in bed right? You still want the hottest girl out there! My first investment will be in a fully comprehensive insurance and some anti theft / tracking system. Mods will have to wait. I already window shopped a lot but isn't the thrill slowly customizing the bike to your needs? Riding gear I already ordered. Gotta stay safe on such a beast! That's actually a very sound idea! Thank you! not to be a nanny, but do not get into the false safety idea that this bike only happens above the 9000rpm line. This bike is plenty fast below that limit as well. Excellent point. The electronics on the bike won't save you from yourself. There is no substitution for proper riding techniques. Up my way, in order to obtain a license, you must complete theory classes, yard work (slow speed maneuvering, emerg braking, avoidance etc) return to the classroom again...complete on road classes with an instructor. Then pass a government closed track test and finally a road test.. Phew! All that said, if you can get instruction from a qualified instructor, it will pay dividends. 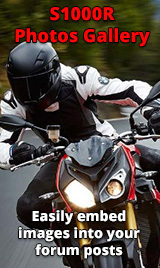 Even after all that, statistics still show 80% of all motorcycle accidents are caused by rider error and more often than not, don't involve another vehicle.